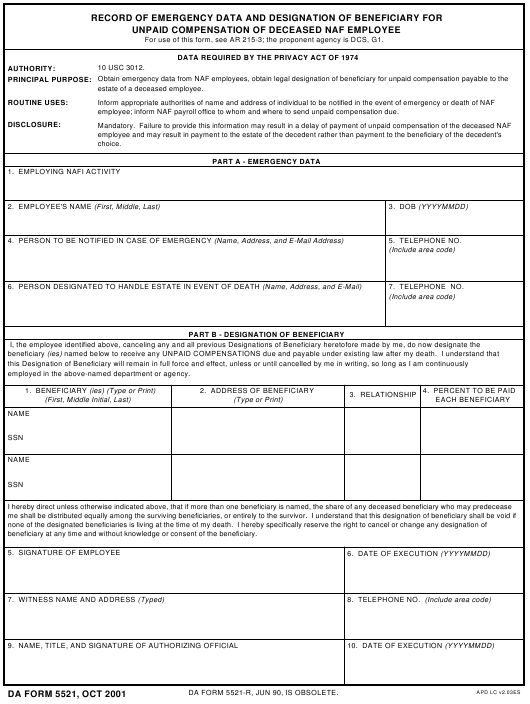 DA Form 5521 or the "Record Of Emergency Data And Designation Of Beneficiary For Unpaid Compensation Of Deceased Naf Employee" is a Department of the Army-issued form used by and within the United States Military. The form - often incorrectly referred to as the DD form 5521 - was last revised on October 1, 2001. Download an up-to-date fillable DA Form 5521 down below in PDF-format or look it up on the Army Publishing Directorate website. estate of a deceased employee. employee; inform NAF payroll office to whom and where to send unpaid compensation due. employed in the above-named department or agency. beneficiary at any time and without knowledge or consent of the beneficiary. DA FORM 5521-R, JUN 90, IS OBSOLETE.